Apparently I have been eating Uncle Bob's Popcorn since I moved to Tucson in 2006 but had no clue. There was a bar we used to frequent down on 4th Avenue that had this jalapeno popcorn blend and was, literally, the only real reason we went there. The place was okay, prices a bit much and pours and bit low but, oh man, that popcorn. It was so delicious. A server there said that they made it on premises and the recipe was a secret. So we kept going back, even though parking sucked and it was favored by pushy students and scenesters that don't know how to tip. Uncle Bob's Popcorn, it said. 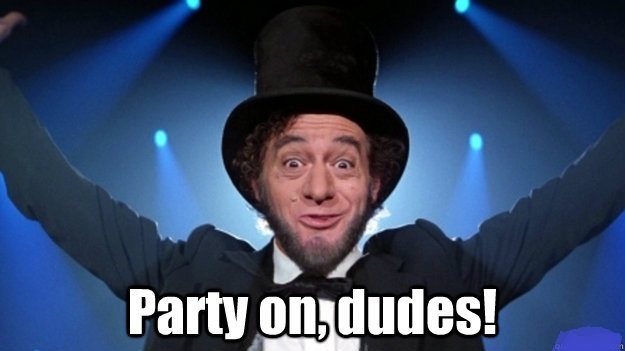 This struck me as awesome because my middle name is Robert and I am named after my late zany uncle, Robert Barron, whom I called 'Uncle Bob' and who you might know as Abe Lincoln from "Bill and Ted's Excellent Adventure". Yes, that's right...he is/was my uncle. That's right, that's my uncle. That's right, it's awesome. Curious, we parked the car and walked in. To our immediate wonder, this place sold all kinds of amazing popcorn and party related food items. Bags and bags of multi-colored kernels, shakers of various flavorings and old timey popcorn poppers for sale or rent. It was a small space but it was packed with delicious bits of popped wonder. Luckily we got a chance to chat with the lady behind the counter and we asked if they knew about the jalapeno popcorn at that bar. "Oh yes," she exclaimed. "We supply them with that popcorn. Have been for years." Ah HA! They've been caught, the lil sneaks. We immediately stopped going to that bar and immediately started buying from Uncle Bob's. We've been much happier ever since. Years passed and we've been loyal customers, even using their popcorn for events at She-Ra's bar and restaurant. 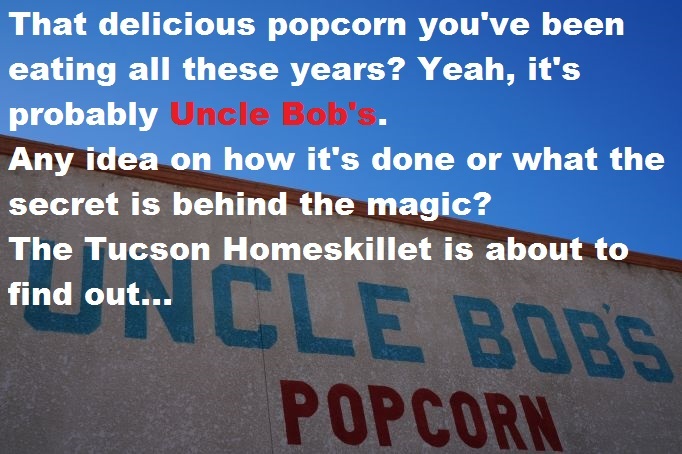 Now that the Tucson Homeskillet is off and running, I had the opportunity to hang out with the fine folks at Uncle Bob's Popcorn to see what makes them, well...pop. "Uncle Bob's has been around since 1963," informs Valarie, one of the owners that has taken over the business since it's inception in the 60s. "He had a little kiosk on Wetmore that grew in popularity. The original owner sold the business in 1986, when it was on Grant and Country Club. The current location, this one, was built in 1988 and we've been here ever since." This elusive Uncle Bob actually hosted children's TV shows here in Tucson from 1961-67. Calling himself "Marshall KGUN" (named after the TV station) he taught kids to respect their parents, how to avoid the dangers on the streets and that vegetables were good to eat. In 1967 he moved to a different station and hosted "The Uncle Bob Show" till 1975. "Oh lots of famous people were on the Marshall KGUN show," Valarie muses. "There were cast members of the Addams Family that stopped by, some of the Three Stooges too. Back then, Tucson had a thriving studio and many of the celebrities that came here to make movies would stop by his show." I then informed her of my own Uncle Bob and his foray into show business. Not too sure what it is about "Uncle Bobs" that want to entertain or make kids happy. But...there they are. The best thing about Uncle Bob's Popcorn is the fact that they pop fresh every day. Pounds upon pounds of hot popping popcorn make their way from industrial sized machines, onto conveyor belts and straight into the bags are a regular circulation. The air in the large hangar sized work area behind the retail shop is thick with buttery oil and freshly popped corn, something that I could get used to very quickly. "As you can guess the equipment has changed a bit since the 1960s," Valarie informs with a head nod. "Okay, it's changed a lot!" The tiny popping machines of yore have given way to factory sized poppers, large rotating turbine silos that separate the un-popped seeds from the perfectly fluffy kernels and something called the Rocket. "This is for all the sweet corn, the caramel and kettle and such," she says. "Can't get the sweet mixed in with the savory!" I was lucky enough to get my hand right in a tumbling field of piping hot aromatic goodness and let me tell you, that stuff you get at the movies or microwave at home? Uh uh. Not even close. This stuff is heavenly and the raw flavor is enough to make your tastebuds quiver. This is before they add their signature seasonings to it and then, then!, it blasts you off into another popping dimension. "But that's a secret I can't reveal," Valarie notes with a wink. "Can't give all of our secrets away." Outside of their retail store on Columbus you can find their goods all across town. Yes, even various pubs that like to claim it as their own. But that popcorn you just had at a recent Wildcats game? Oh yeah, that's these guys. You were just crunching down on some Uncle Bob's realness. "Our school rocks! ", enthuses Valarie. "We love the Wildcats and we are proud to have our popcorn there. At the games, in the stands...we love it." The best part is, Uncle Bob's really hasn't changed much, nor will it ever, if the current owners have their way, and that's what keeps people coming back. Little did I know when we walked through the tinkling doors almost a decade ago that we were walking into some Tucson history. Folks of all kinds, generations, have stepped through the same door and will for years to come. But in 1978, that tradition almost didn't continue. A fire broke out causing thousands of dollars in damage and things didn't look good for the local business. It took years to rebuild but the community came together and because of that we now have years more to look forward to enjoying some of the best popcorn around. Or anywhere really. Now it's your turn to make a tradition by eating real popcorn made by real good people. You'll thank me for it later. Uncle Bob's is addicting. I like the sour apple, caramel, and kettle corn. I literally would eat 3 bags of thus stuff daily. Good review! From the office centered viewpoint it is to be inquired as to why arrangement producers dissertation methodology who have been distinguished as causing the issues in any case, would all of a sudden consent to acknowledge establishments.! Projects that enable one to buy degrees top rated essay writing services and different accreditations are not certify by a legitimate authorizing office. The primary thing you ought to do when you settle on a separation COMPUTER SCIENCE MUT learning program is to check and check whether the program is authorize. I read this article. I think You put a lot of effort to create this article. tyagi public school keshav puram I appreciate your work. 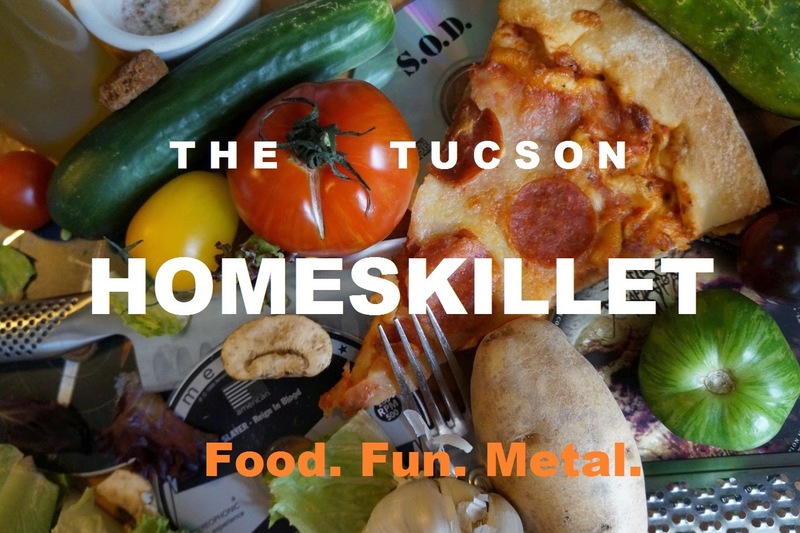 New Kids on the Beer Block: The Tucson Hop Shop!